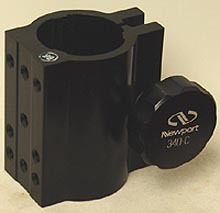 The Newport 340-C Rod Clamp has a machined face, which is drilled and tapped to mount other Newport items. It fits all standard 1-1/2 inch diameter rods. This includes the Newport model 40 and 45 rods.